I guess its my awareness, you see the universe sends us messages for important points in our life, we tend to ignore these numbers, sometimes we might see this number pop up throughout the day. Some of us might not see this number at all, I am sure its all do with our awareness and level of consciousness. What should we do when these special numbers show up in our lives? We should embrace these messages from Source and let it flow through you, make it part of your physical reality, after all you are Source experiencing itself as a physical vessel. So what is the spiritual meaning of 444? 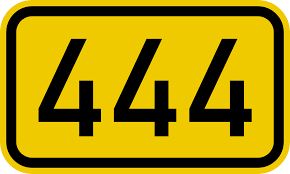 Number 444 is about understanding, when you see this number make note that something important has happened which needs to be understood. Number 444 is 12 and 3 in numerology, it represents the working universe and how you relate to it, meaning there is something that needs your attention and you should get it. The cosmic alignment of this number calls out for your attention, wake up call, activation whatever you feel resonates with you. The message is that you need to be aware of something very important that has happened or about to happen. This is a very special number, the universe has aligned with you chosen you along with others, sending out this cosmic message. What should I be doing now? It’s time to pay attention to signs that you may see around you, there could be other numbers, people, something someone might say to you or even the music you are listening to. There might be particular words that may have resonated with you in some wayor could be specific way you are feeling about something. When you feel you are ready to know this message your subconscious mind will be guiding your conscious self to understand and make sense to you. Number 444 specifically refers to not or nothing good. It’s just a heads up reminder for you, for you to be aware whats going on around you. There are some questions you might want ask your self like, am I giving less significant meaning to something in my life that should be more important? Do I know the system I am working on? Do I need to do some deeper thinking about something important? Have I chosen the right path? Am I really aware of what’s going on? When you see the number 444 it doesn’t really mean its connected to something that’s happening now. It could perhaps be something you have invested emotionally in or something that’s really occupied your mind recently. To summarize spiritual meaning of 444, is a heads up, you should check the signs, think about this, understand the system and follow your intuition, this might be important to you or related information heading your way. The number is about, look more closely to this, see what’s going on and be more aware of the signs. The information will make more sense when the time is right. Appreciate this special number. What If I Told You That You Are Living The Same Day Over And Over Again?